The Air Jordan XI is one of the most iconic sneakers around. The shoe was designed by Tinker Hatfield in the mid 90s while Michael Jordan had retired from basketball to pursue a short career in minor league baseball (and we All know how that went ...). Popularity for the XIs gained much interest after many got their first glimpse of it in the 1996 mild block-buster Spacejam starring MJ and the Looney Tunes. Though the Spacejam and Concord versions are known and loved; none seem more revered than the Black/red/white – Breds combo. 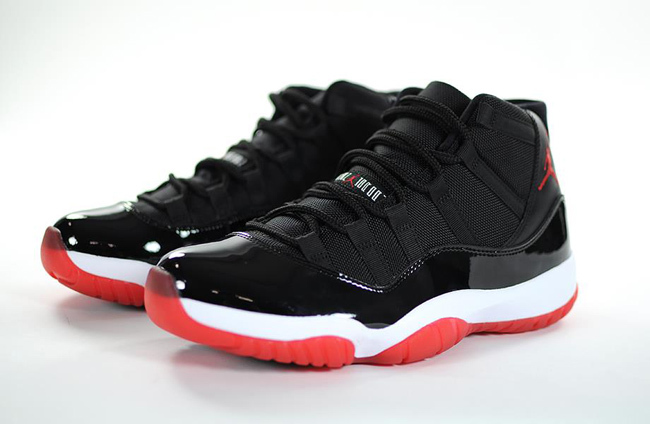 The Air Jordan XIs sports patent leather with a ballistic mesh and carbon fiber in parts of soles for an overall lighter, flexible and durable shoe. Today, this iconic silhouette has been adopted and presented in the form of a bag! 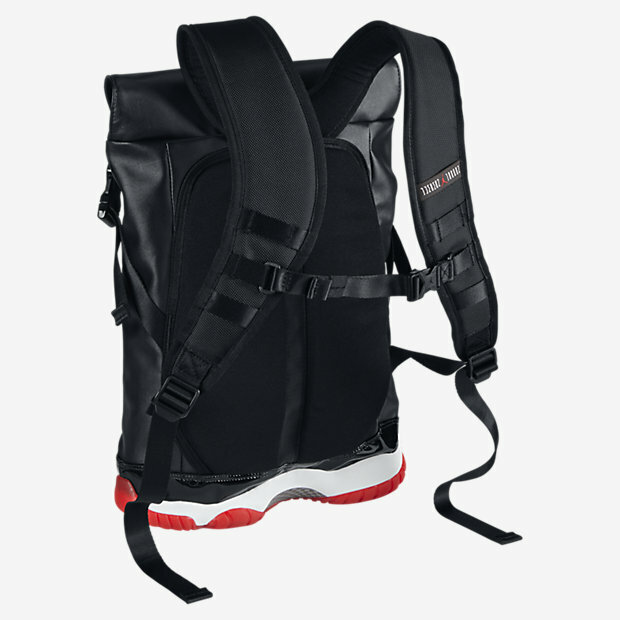 On December 11, 2014 Nike released the Jordan XI Premium Shoe Bag in true Bred fashion and décor. The bag sports a nylon mesh and patent leather for lightweight durability. A top-load design with drawstring allows for easy placement and access to your items. Adjustable shoulder straps for a nice fit and comfort. 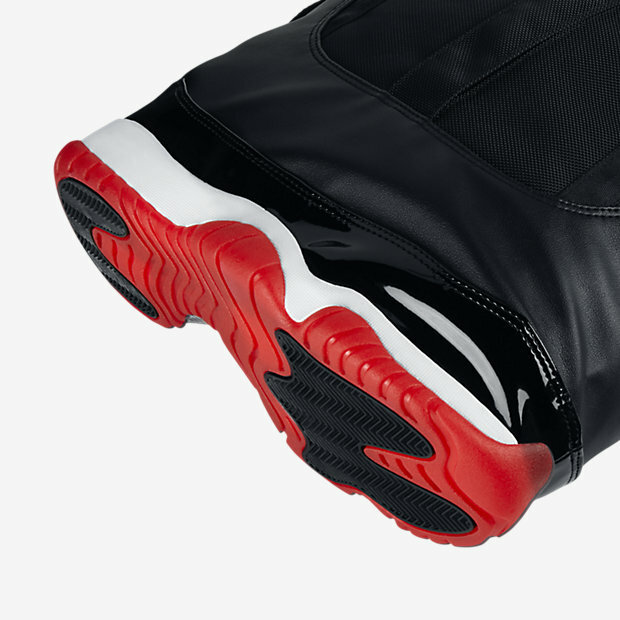 And most of all an AJ XI-esque rubber outsole on the bottom for style and protection of your gear! The bags dimensions are 48cm H x 38cm W x 6cm D; which is reasonable for small-medium sized items like your shoes, books, water etc. to the gym, ballpark or class. Though they retail for $250, don’t expect too much use from these other than to match ‘em with your retro AJ XI Breds, look reasonably stylish while doing so, and of course, packing a few kicks in there too (insert Xzibit shoe within a shoe joke here). Either way, this bag will be one to remember as it is able to bridge the memories of yesteryears ‘90s kids with today’s new generation and their never ending appreciation of what we consider to be cool – The AJ XI and Michael Jordan ... one of the greatest basketball players ever known. Could you use these for a sole swap?